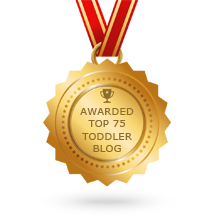 Biting from Overwhelm - Joyful Toddlers! I have a group of 8 toddlers, and I wonder if you can give me some help for a biter. I’ve been watching, and it seems like she bites when she’s overwhelmed, for example after snack when many people were around her and bumping into her. On the other hand, she also bites and grabs at times when there is not as many children around; it seems like at times someone is just near by and she grabs them and bites. On days when we have a smaller group she bites and grabs less, though. We’ve been quite firm and consistent in our response when she bites, giving her a firm “no,” comforting the hurt child, and having the biter get the ice pack to help the child feel better. But there doesn’t seem to be any change, and it’s driving me crazy. Help! Biting is one of the most difficult behavior issues to address, because it pushes our buttons, and it pushes the buttons of the parents whose children are getting bitten, and it pushes the buttons of the parents whose child is biting! A lot of emotion going around. It’s important that you let all of the parents involved know that you are taking it seriously and that you’re all on the same team. For the little girl, it sounds like you’re doing a lot of things right, being consistent and firm, giving her a chance to make things right, etc. I think that you’re right-on in thinking it’s due to overwhelm. Overwhelm can be cumulative, so even the times when there’s no obvious cause can still be from that. Children at this age have no filters; they can’t ignore noise, they can’t ignore business, they can’t ignore anything. And many children don’t know what to do with all of these sensations buzzing around inside of them. It can come out if someone gets too close, but it can also build and build and they will go searching for a way to let it out, often letting people know they’re uncomfortable by being aggressive to another child. I had one child in my program who would be fine the first half of the morning, but as soon as parents started coming to pick their children up, he would go wild and often hurt several children right as his parent arrived. Aside from the direct actions you’re already taking, here are a few ideas to help her in more indirect ways. One way to work with children who bite from overwhelm is to help release all of these sensations on a regular basis. With my little boy, I would do this by taking him away from the action, into the nap-room on a regular basis. We’d rock for a moment or two in the dark, and then I’d stroke down his arms, legs and back with a slow, firm stroke. I would imagine all of the buzzing inside of his body coming out of his hands and feet, being released. Then we’d heave a deep sigh, and go re-join the others. If I did this three times over the course of the morning, he did much, much better with the other children. If it’s not practical for you to take this little girl into another room, you might try setting up a small, cozy space where she can get away from all the stimulation: a cardboard box with a cushion and a blanket can work well. Let her and all the other children know that this is a space just for her, and help her start to love this space. You might also periodically play a game with all of the children where you pretend that you’re all sleeping, and turn out the lights and sing a soft song, covering them with silks or play-cloths. Then as they ‘wake up,’ you can play at getting dressed, having breakfast, etc. 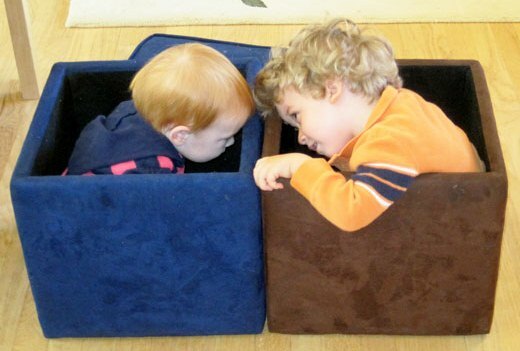 Toddlers love this game, and as they get to know it, will actually pretend to sleep for quite a few minutes. This can be a nice release for all the children, but perhaps vital for that little girl. I love your comments! Please comment below.